PLEASE NOTE: YOU DO NOT HAVE AN ORDER/DATE IF NO RETAINER HAVE BEEN PLACED TO SECURE YOUR SPOT!!!! ***ALL Cakes are Custom made per your order description and therefore a minimum of $30.00 - 50% Retainer Fee is required depending on event type to secure your date. ALL orders must be paid in FULL prior to delivery. Wedding & Large Event Cakes(Tier Cakes) 14 days prior to due date. You will be invoiced and you may pay through the invoice link or hit the Buy Now Link and pay reqired amount. 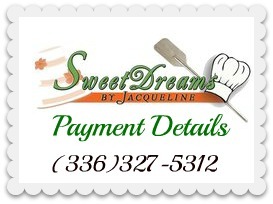 If there are any problems with the link please contact Jacqueline at (336)327-5312. ALL Cakes are Custom made per your order description and therefore a minimum of $30.00 - $75 Non-Refundable Retainer Fee is required depending on event type to secure your date (Retainer Discussed in ALL Contracts). ALL orders must be paid in FULL 3 days prior to delivery. Wedding & Large Event Cakes(Tier Cakes) 14 days prior to due date.